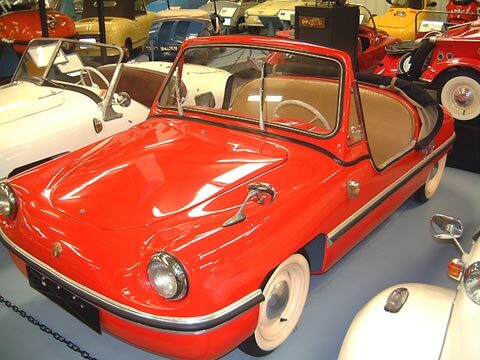 Being quite familiar with the shortcomings of the Spatz through sales and service of the Spatz for Harald Friederich, the motorcycle engineers at Victoria set about overhauling the design of the little car. Everyone had been very impressed by the Gullwing Coupe Spatz shown by Friederich at the IFMA show in 1956, and built by him in small numbers. Victoria built one, as well as a Cabrio with doors and roll up windows. A Coupe with doors and sliding windows and large rear window was also built. All were nixed for being too heavy. Only the roadster style would continue to be built. Having only motorcycle motors to hand, Victoria developed a new 250cc motor and matching gearbox for the car. With it came a five-gear electronic gearshift much like that found on Goggomobil, except that it it used three dash-mounted buttons: reverse, neutral and first, and with second, third and fourth selected by a small lever in conjunction with the clutch. The first examples left the works in June 1957. With its fiberglass bodyshell, it was called the "one-eighth Corvette", referring to the other fiberglass car across the pond with seven more cylinders. It was already evident by October of the same year that the market would not support another minicar. Production ended in February 1958. The museum example, with the lowest known serial number, was restored for the first Bruce Weiner Collection, sold at Christies in 1997, and returned to the fold seven years later.